Within the past several years argan oil has been introduced to a global market as a beauty elixir. Now, the argan oil industry appears to keep repaying the country from which this amazing oil came from. Argan trees are protected by UNESCO, and many cooperatives share profits of the oil with the local people, which goes back to their community and keeps the industry there sustainable. 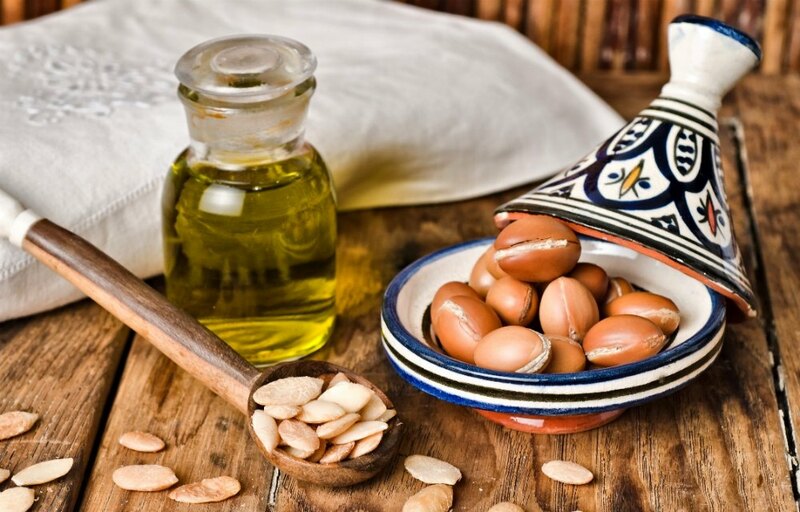 Argan oil is often referred to as “liquid gold” because of its reputation for treating a variety of physical conditions and as an anti-aging aid. Argan oil is very rich in beneficial nutrients including vitamin E and fatty acids. Its properties make it particularly beneficial for skin and hair, which makes it a popular cosmetic choice for many people. Here are 15 uses for argan oil. Since argan oil regulates the production of sebum (1), which causes acne, its use can help reduce further breakouts. The vitamin E present in the oil contains anti-oxidants that help remove dead cells and help new ones grow, therefore fading acne scars. 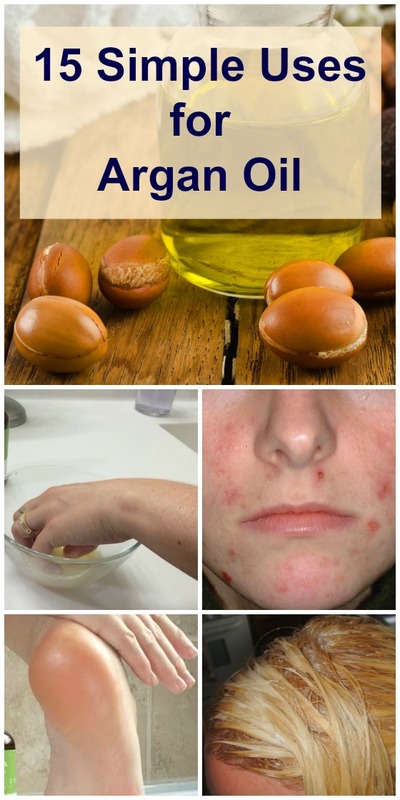 If you are using argan oil as your moisturizer, but are still fighting acne, place a drop in the palm of your hand and lightly dab a bit extra into problem areas. High temperature is extremely harmful for your hair. You can definitely protect your hair from heat by using argan oil. Apply it regularly on your hair to minimize the harsh effect of heat. It is best to apply 2-3 times a week to condition and repair the hair shaft. Massage a few drops of argan oil into your cuticles to soften, moisturize and encourage nail growth. Use as an overnight treatment to nourish cracked heels by working a good amount into your feet and toes. A layer of argan oil and a night spent sleeping in socks softened feet, made residual injuries less obvious, and cleared up dry skin. Argan oil is often used as a key ingredient in shampoos due to its ability to restore softness, strength and shine to hair. It is an ideal ingredient to search for in a shampoo for anyone suffering from dry hair or hair damaged by chemicals and coloring. After cleansing morning or night, massage a few drops of argan oil directly onto your face and neck in a circular motion. Argan oil absorbs quickly, and does not leave an oily residue. If you want to use it as a serum, apply your night cream after the oil absorbs into the skin. Although a little goes a long way, an overnight treatment is a great way to maximize the effects of argan oil on hair. Using a larger quantity of argan oil as a hair mask means that as many of the nutrients as possible will be absorbed. This is a great treatment to use the night before a special event when you want your hair to be extra smooth, sleek and voluminous also cool and exotic smell will stay along the day. This treatment is easy to do at home. Use a generous amount of the oil for this treatment. Massage it into your scalp, hair and tips and then wrap your hair up in a towel to prevent it from staining your pillow. Leave the treatment in overnight (or for a few hours) and then wash the argan oil out the next morning with your regular shampoo. Your hair will look sensational and you won’t have exposed your hair to any of the chemicals present in many regular conditioning hair masks. Split ends occur when the protective outer layer of the hair cuticle wears away because of external stressors such as heat styling and salon chemical services. When applied to hair, argan oil prevents drying and environmental damage by coating the hair shaft. The oil seals in moisture and smooths fly-aways, making hair more manageable and less prone to breakage from brushing and styling. Argan oil can also help seal in colorants such as henna and amla, increasing the length of time between colorings. Rich in vitamin E, argan oil nourishes hair, repairing split ends, and increases hair’s shine and overall healthy appearance. Exfoliating with argan oil gently cleans away dirt, excess oil and dead cells, to leave your complexion healthier, softer and brighter. To experience the argan oil benefits while exfoliating, just mix 1 tablespoon of brown sugar with a couple of drops of argan oil in your hand. Rub into your face in a circular motion for 2-4 minutes; pay special attention to acne prone areas and areas that are dry. Rinse with warm water, and pat dry. Regular exfoliation helps remove dead skin cells and reduce the appearance of fine lines and wrinkles, while giving you a younger fresher complexion. With the aid of the brown sugar, the argan oil’s nutrients are more readily absorbed into your skin. As argan oil is a great hair moisturizer (2), you can use it as your hair treatment oil too. Using this on your scalp will nourish your hair and reduce dry scalp. Argan oil can be directly applied onto your scalp. You can also use it as the warm oil for the best positive results. Warm about 4-10 drops of argan oil by rubbing between your palms. Apply the oil onto your scalp and massage well. Then place a shower cap and leave the oil on your scalp a few hours before shampoo. You can also leave it overnight if you have dandruff. Do this treatment twice per week to get rid of dandruff. Bright and radiant skin is a sign of healthy skin. If you are willing to pile layers of makeup on your skin, perhaps you will be successful in achieving that skin brightening effect in the shortest time possible. But nothing can beat the naturally bright and glowing skin that makes you stand out in a crowd. That’s why, don’t forget to try out the amazing homemade skin brightening face masks which are made out of natural ingredients that are readily available. Mix together one tablespoon of lemon juice, 3 teaspoons of yogurt, one tablespoon of honey and 3 drops of argan oil in a bowl. Apply on a clean, dry face and leave on for 10 minutes. A nourishing and hydrating argan oil mask is excellent for aging skin (3). For this recipe, you will need 2 tablespoons of avocado, one tablespoon of honey, one tablespoon of oat flour, and one tablespoon of argan oil. Slice an avocado in half, take 2 tablespoons, and then mash it well in a bowl. Add the oat flour and the honey and mix and mash some more until you have a rather smooth but pasty substance. Add the oil last and give it one more go. Start with a clean, dry face. Apply your mask all over your face and neck. Massage this in for about 5 minutes then let it sit for 30 minutes. Then, rinse off with cold water and pat dry. Follow up with your favorite moisturizer. Especially in cold or dry weather, lips can easily become dry and cracked. Argan oil is the ideal product to ensure lips stay plump, soft and supple. Rub a drop or two into dry lips as a balm – but be sure to wipe off any excess. Toasted culinary argan oil has a distinctive nutty taste which has attracted the attention of gourmet chefs around the world. It is best used as a finishing oil to drizzle on fish, vegetables, soups and pasta. It is delicious eaten simply with bread and is great in salad dressings.